HARLOT NATURE makes her debut! 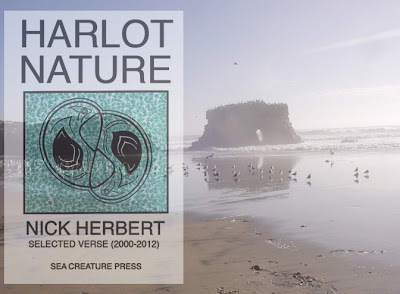 HARLOT NATURE (2012) from Sea Creature Press is Nick Herbert's latest collection of visionary poetry and prose in which Nick attempts to express in words the essence of quantum tantra--the future science of the third millennium. Quantum tantra proposes to use the science of quantum physics not merely to explain new physical phenomena but to unite human minds with the minds in nature in a direct and unprecedented way. Nick supposes that many extraterrestrial cultures already enjoy this purely quantum way of merging with nature, so part of Harlot Nature explores contact with seriously advanced alien civilizations--what that might actually feel like. [For one possible fore-taste of the quantum tantric experience check out Rudy Rucker's Panpsychism Proved which Rudy published in Nature magazine in January 2006]. Besides the title work, Harlot Nature includes Tantric Jihad, How I Conquered Death, 2000-Year-Old Pickup Line, No More Safe Science, the lyrics to Urge: A Short Opera About Reality and much more. HARLOT NATURE is itself participatory with contributions from Nick's late wife Betsy Rasumny, physics chanteuse Lynda Williams, German translations by Reno de Caro and illustrations by August O'Connor, Kim Fulton-Bennett and Khola Shou Herbert. 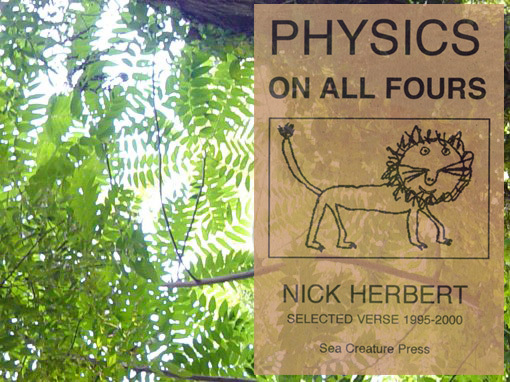 PHYSICS ON ALL FOURS returns! is physics on all fours. PHYSICS ON ALL FOURS (2000) is the predecessor text to Harlot Nature, Nick Herbert's first clumsy baby steps towards discovering a fresh intimate physics-based union with nature. Nick's son Khola Shou illustrated this book with unusual drawings of sea creatures and a smiling lion cover. Physics on All Fours includes Jabir's Formula which encapsulates the essence of quantum tantra, 99 Names of Goddess, Meta-docs on Duty, Stolen Dope, The Man Who Married the Sea plus the tantra physics anthem Elements of Tantra whose chorus echos the common theme of both Physics on All Fours and Harlot Nature. 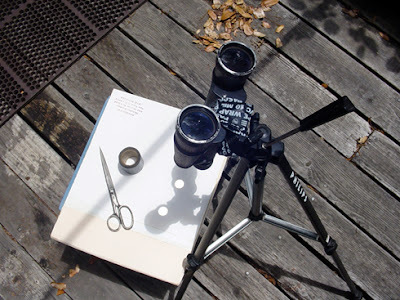 I had heard that there was to be a transit of Venus on June 5 (which also happens to be my son's birthday) so I constructed a solar observatory on my deck in Boulder Creek to observe this event. The instrument consisted of a pair of 7 x 50 binoculars duct-taped to a tripod which focused the sun's image on a piece of white cardboard which was fixed at the proper distance and angle with a plastic milk crate and some books. 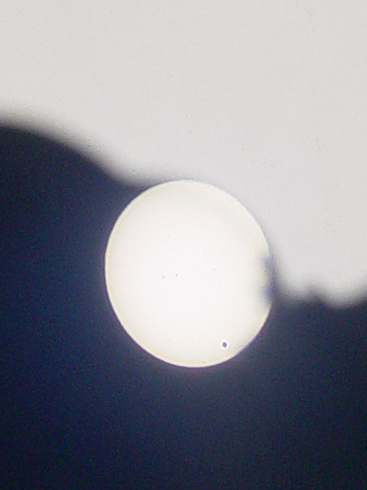 At approximately 3 PM the silhouette of Venus began to appear on the lower right edge of the Sun's image and to move slowly from right to left across the Sun's disc. The transit itself looks like nothing so much as a speck of dirt until you realize that the object that's making that speck is an Earth-sized planet about 30 million miles away traveling across the face of the Sun which is about 100 million miles away. 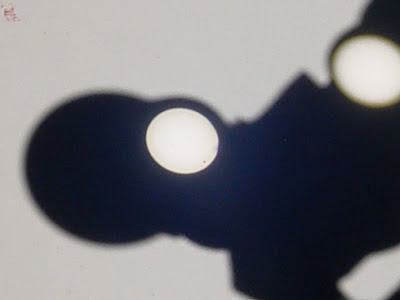 Transits of Venus are rare--only eight have occurred since the invention of the telescope. These transits occur in pairs spaced 8 years apart--today's transit was the second member of the pairing. The first of the pair occurred on June 8, 2004. These pairs are separated by periods of approximately 100 years so an observation of a transit of Venus is a once-in-a-lifetime event. (Actually twice-in-a-lifetime). The next transit is due to occur in the year 2117. My deck is not ideal for solar observations. Around 4:30 PM the Sun dipped below the redwoods so I was able to catch only about an hour and a half of this century's final transit of Venus. Venus transit just before Sun hits trees. I went to the Boulder Creek post office this afternoon to pay bills and get my mail. 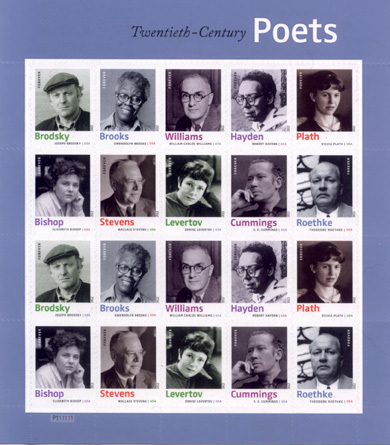 Discovered that the US government is honoring poets by putting their faces on postage stamps and publishing a few lines of their verse on the back of the peel-off sheet. This cultural gesture inspired me to nominate my own faces and verses for possible inclusion on a future edition of US Poetry stamps. looking for an angry fix. 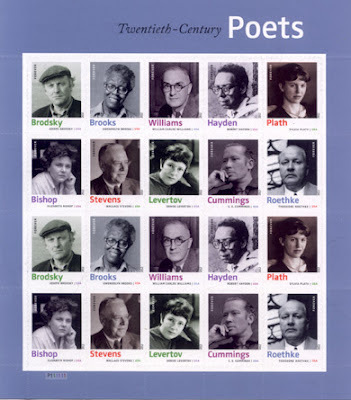 Support the practice of poetry in the USA. Please use these new stamps freely on your blogs, in your eMail, your peer-to-peer file exchanges and in your electronic funds transfers.